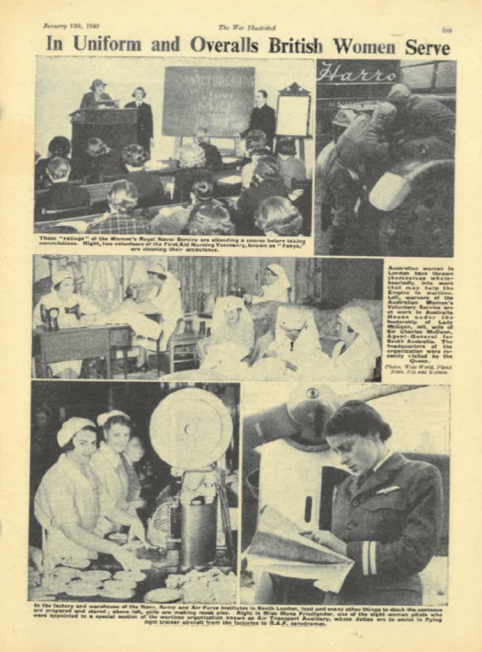 ‘The War Illustrated’ magazine article brought in by one of the Kenley Revival Project volunteers, the article is demonstrating the hard work that women put into the war effort, different images of women either in uniforms or overalls. Imaged in the bottom right of the page is one of the ATA (Air Transport Auxiliary) women, Mona Friedlander, she was one of the first eight women to become part of the ATA group of ladies, holding the responsibility of flying many types of aircraft between factories and RAF stations. Opposite this image is a group of ladies who had the role of working in big industries to prepare food for army, navy and air force, in this image they are preparing meat pies for everyone.